This is the first in a long series of fictional books about the Immortal Nicholas Flamel. Nicholas Flamel and his wife Perenelle are historical characters. Nicholas Flamel was born in Paris in 1330 and the records show that he and his wife died in 1418. He was an alchemist of note and his tomb was raided for his “secrets”. The tomb was found empty. Dr. John Dee is also a historical character. He was the magician/advisor to Queen Elizabeth I. 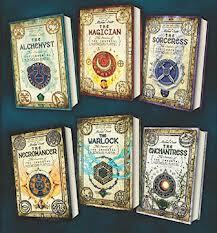 He would have been familiar with Nicholas Flamel and probably had many of Flamel’s works in his extensive library. In these novels Dee serves as the counterpoint to Flamel and they battle over whether or not to encourage the return of the Elder Race to power in the world. The premise is that all of our myths and religions, all of mankind’s Deities had some initial source in reality. The truth of the novels being that the world and humanity are much older than we ever imagined. It is clear that Scott knows his mythology and he draws from a wide range of myths and legends to people his otherworldly characters. I did have some question about how they line up on either Dee’s or Flamel’s side of the argument. The story is framed as good against evil. The prophecy that the story fulfills is a little more ambiguous. I suspect my confusion about which Gods and Heros line up on who’s side indicates that the viewpoint of good vs evil is more truthfully Flamel’s interpretation of the best outcome vs Dee’s. The story involves two teenage twins. The reason this series didn’t take off the way Rick Riordan’s series or even the Harry Potter books is clearly because the primary point of view is not the teens’, but Flamel’s. In fact the teens are not particularly well written. I’m kind of hoping they grow into adults quickly in the series as I suspect that will make them more interesting. This book also ended with a little too much undone to truly stand alone. I am going to work my way through the rest of the series. The premise intrigues me and I am contented with Flamel’s point of view rather than that of the teens. I think the series has promise and I enjoy this kind of modern exploration of mythology. I don’t know that you’ll get reviews of every book, but I will try to remember to write a review of the entire series when I finish. This series is already written so I don’t have to wait for the next book. My favorite kind!